It was Jazz night at the local restaurant. It was to be a barbecue because last week for the Salsa night it was Paella. We had booked to barbie but as we took our seats by the musicians table they were eating large amounts of what looked like – Paella. I had guessed that they were jazz musicians because one of them was wearing an arty winter scarf, a T shirt and jeans. Le patron appeared. “Oh dear – you booked the barbecue – oh yes- but it is Paella – it is just as good.” Two of our party were not seafood fans. We ordered Paella without the seafood. The musicians munched on – even asking for more. Perhaps they don’t get paid. Suddenly a DIVA trotted in from somewhere across the street. She dashed around a little, then took the micro to explain that she was exhausted because she had been so busy with important concerts at places she described as “Blah blah blah” and another equally important place called “Blah blah blah.” She told us not to worry and that after some red wine she would be her normal fantastic self. She sat with some friends and chatted and then sang a little before going back to her friends to smoke a cigarette and take some medicine. The band played on – she had been in mid song – but such conduct is normal among indoor scarf summer time wearing folk I believe. We munched the non barbecue, partially non seafood Paella. The music stopped. The Diva explained “Now – important – MONGE.” She sat down with her friends to eat. We paid up and left. Some shows are better than others. Last week’s singer was fabulous. I suspect that Monsieur Le Patron has had better days. We ate at about 4pm. It was hot. These guys are old work colleagues and are just so modern and clever. They know about things like machines that build micro chip machines that go inside computers. I kinda know how to heat up chips in a microwave. She speaks French/American. He speaks Franglo-americano. The kids sound American but adore baguettes. It’s called evolution. They had to go – but I wish they had stayed. I want to talk about saving the world, conserving energy and recycling carbon footprints. All of this is embodied in a single concept. The photo today is of a wonderful product that will turn you into a paragon of preservation. 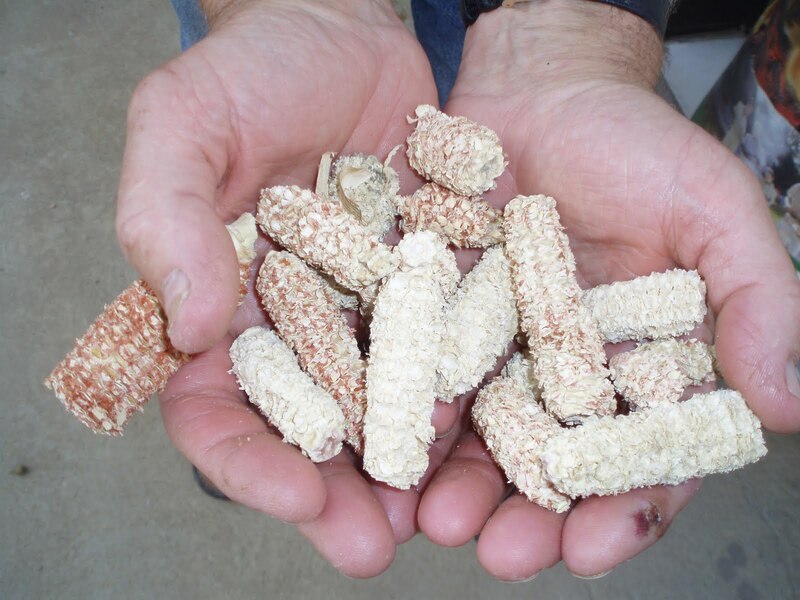 The idea is to recycle the kernels of maize into barbecue fuel. I walked from Carrefour with a kinda eco-warrior maiden swagger- a bit like Boadecia-pelting the Romans with re-cycled toilet rolls. We lit the barbecue. Flames shot skyward. Some red embers remained. We semi cooked 4 sausages. The fuel ran out. The future looks – well-cold and raw. Probably best to just eat the fuel. Emma thinx: If you’re singing for your supper – ask for an advance. Folks are fickle. This entry was posted in Cooking, Emma Calin, Food, France, Music by emmacalin. Bookmark the permalink.